OpenSHMEM 2018: Fifth Workshop on OpenSHMEM and Related Technologies. 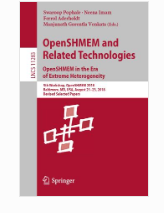 "OpenSHMEM in the era of Extreme Heterogeneity"
The workshop proceedings are now available. Please go to https://link.springer.com/book/10.1007/978-3-030-04918-8 to download your copy.